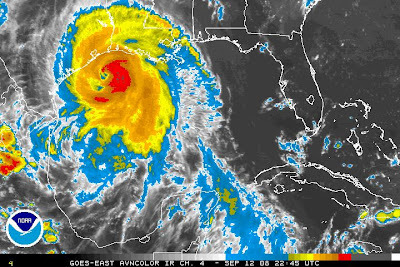 Hurricane Ike (at the last update) is very near a Category 3 and is strengthening. A 'worst-case scenario' is developing. Between severe damage in Galveston and damage to the Houston ship channel and damage to the refineries, we are looking at the 'perfect storm'...I hope I'm wrong. Can you believe 11,000 people have stayed behind in Galveston. I call them nut jobs. Ike website from the NWS. The potential destruction to our fuel industry is a bit disturbing. Let's hope it all comes through unscathed. Tornadoes have struck tonight in Kansas and Missouri along a STRONG front. More here from Severe Studios.